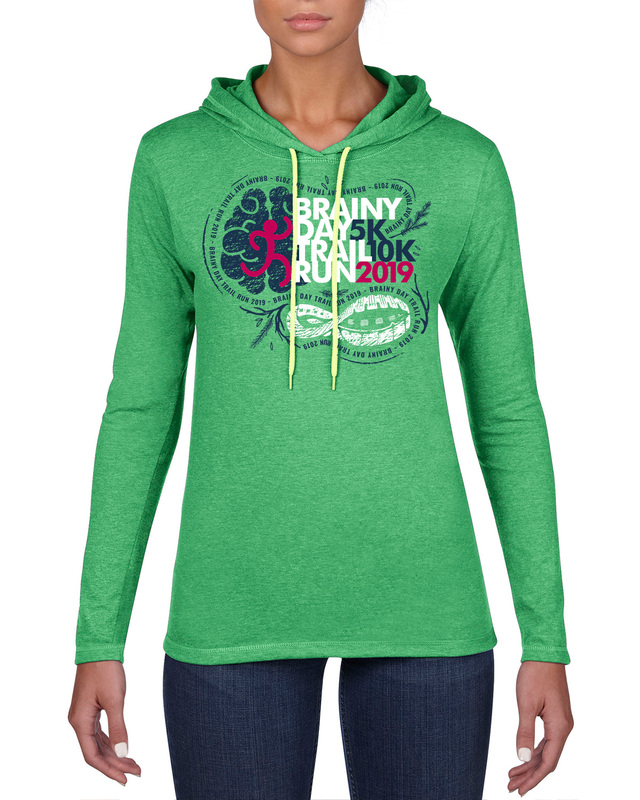 Help us celebrate The 13th Annual Brainy Day 5K & 10K Trail Run. Run the race that has the second-best race announcer in West Michigan and the third-best benefiting non-profit, – according to the 2018 Stellafly FLY Awards. This great local event supports those who are affected by a neurological condition called hydrocephalus. 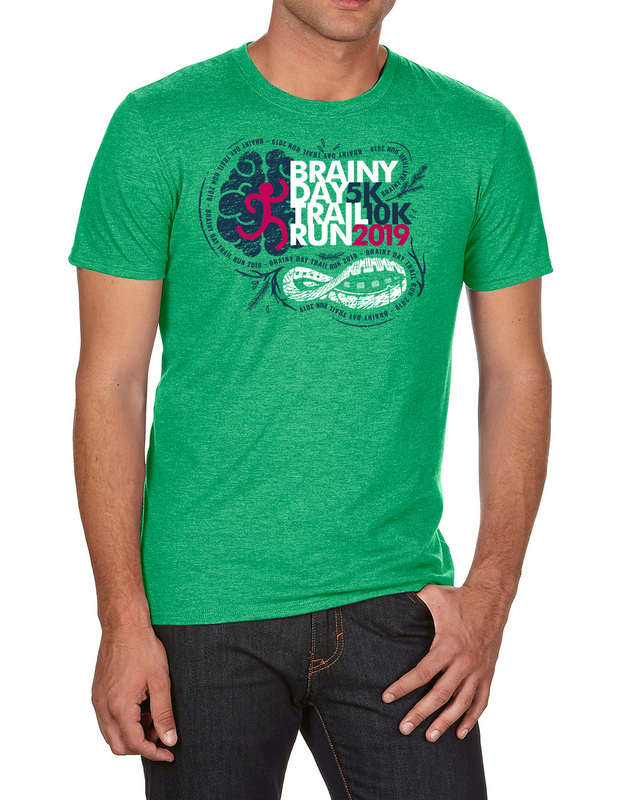 All proceeds from this race are donated to The Brainy Day Fund. The money raised by the Fund is used to directly support families that are dealing with this condition in their daily lives. Whether we're sponsoring a child to go to a special summer camp just for kids with hydrocephalus or providing research grants, our goal is to make as much of an impact as possible. The 5K course includes sandy areas, hills, wooded areas, pond and beautiful Nunica farmland. It is a great first trail run for beginners and a moderately fast course for trail lovers of all skill levels. We had some incredible feedback from our After-Party in 2018, so much so that we're bringing it back in 2019. This race is not just about showing up and running, this is a family-friendly event. The after-party is open to runners and their family & friends. We're bringing back the FRESH FRUIT from Mellema Farms, PIZZA from Papa Murphy's, FROZEN YOGURT from Menchie's, and for Anyone who is 21+, adult beverages. Coming back again in 2019 is our custom Finisher Medals. Big thanks to Maxwell Medals for this year's amazing design on both the medal and ribbons. 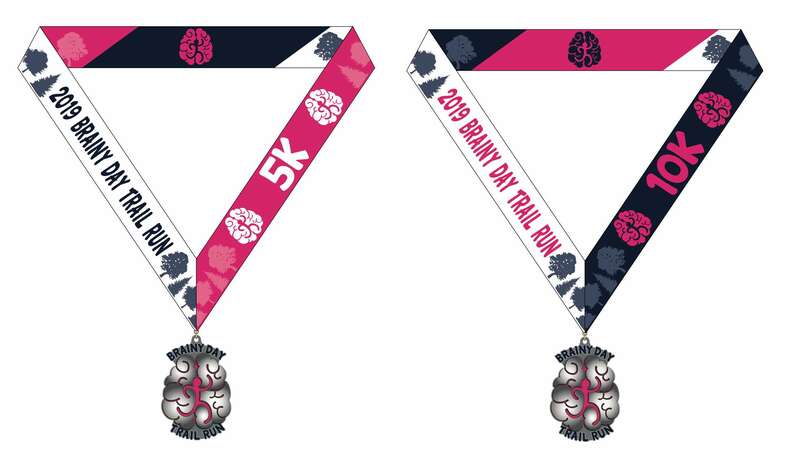 Unique ribbon designs for 5K & 10K; if you finish both races you will receive two medals! Thanks to the great work from Drivn Threads, the race's 2019 shirt design takes elements from our new logo and gives it a fresh feel. 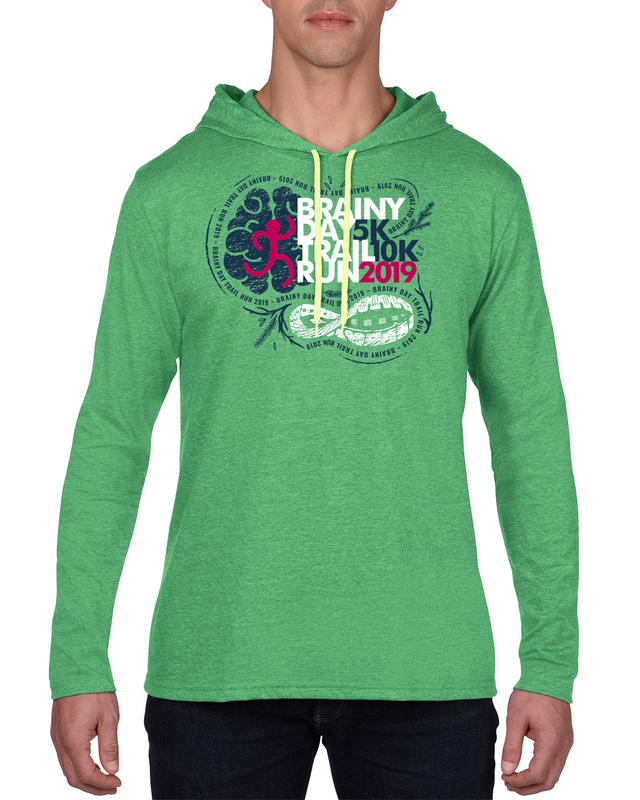 We want you to proudly wear your Brainy Day gear for years to come (keep in mind, shirts are not included with your registration fee). 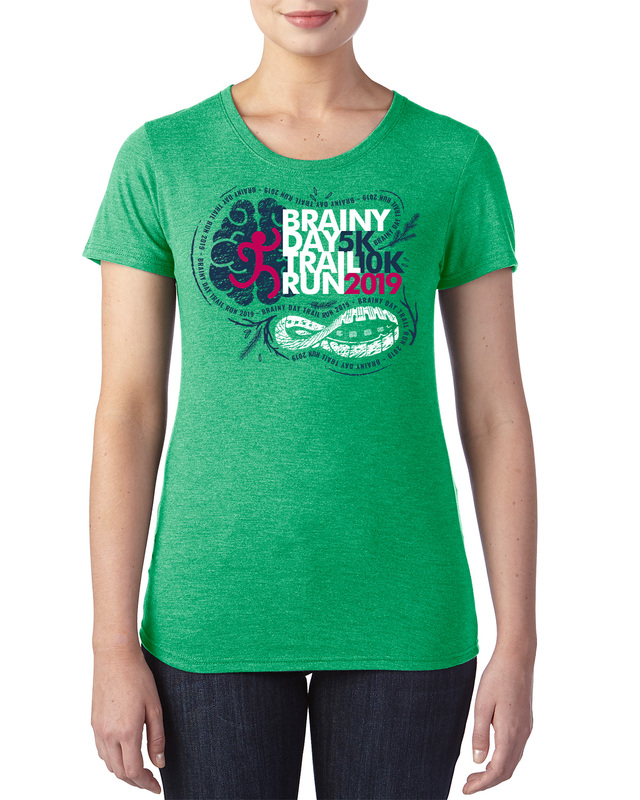 If you feel like you have too many race shirts in your closet, you can simply register for the race. Drivn is behind the race logos of the Grand Rapids Triathlon, MiTi and Grand Rapids Beer Mile. 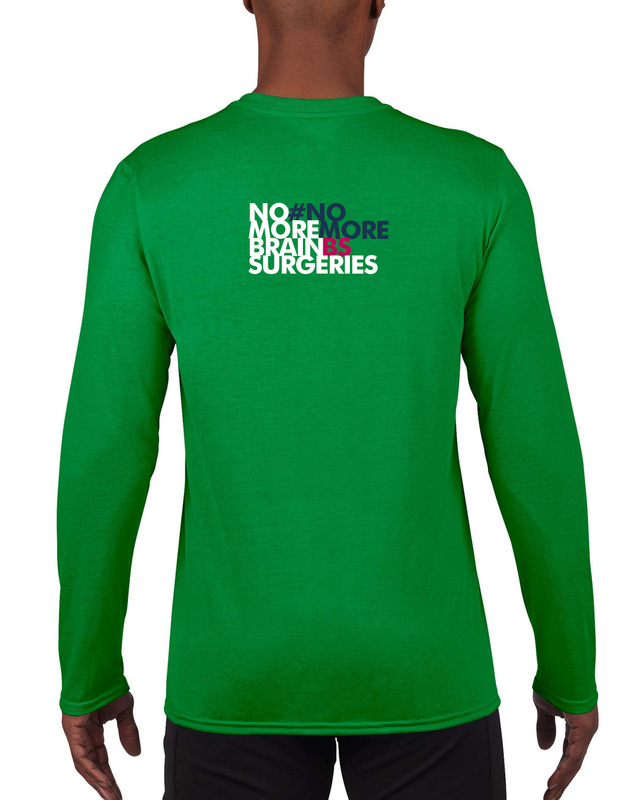 In 2018, we offered a shirt style that promoted the "No More Brain Surgeries" National Campaign, a.k.a. #NoMoreBS. Some folks thought that was too provocative for their tastes – which is totally understandable. 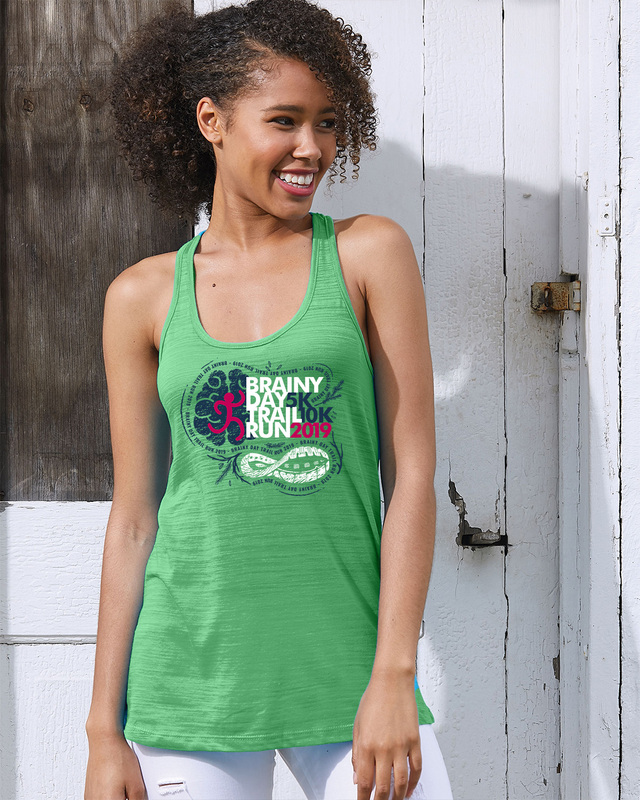 This year, we're doing the campaign again, but we've changed the design slightly to place more emphasis on "No More Brain Surgeries" AND we've added a fundraising component. 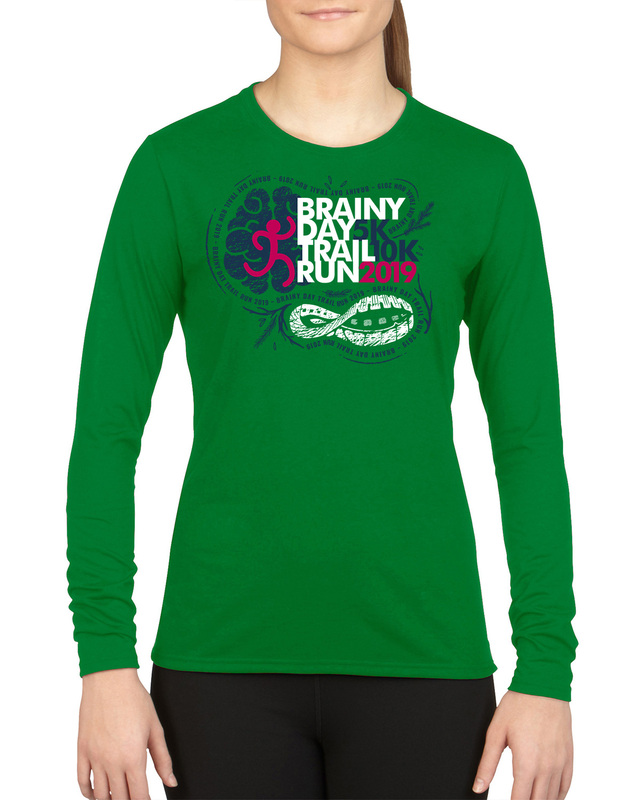 The "No More Brain Surgeries" version of the long-sleeved shirt will be sold at a premium price of $25; we'll be donating ALL PROCEEDS from this shirt design to support the Hydrocephalus Association and the #NoMoreBS campaign. 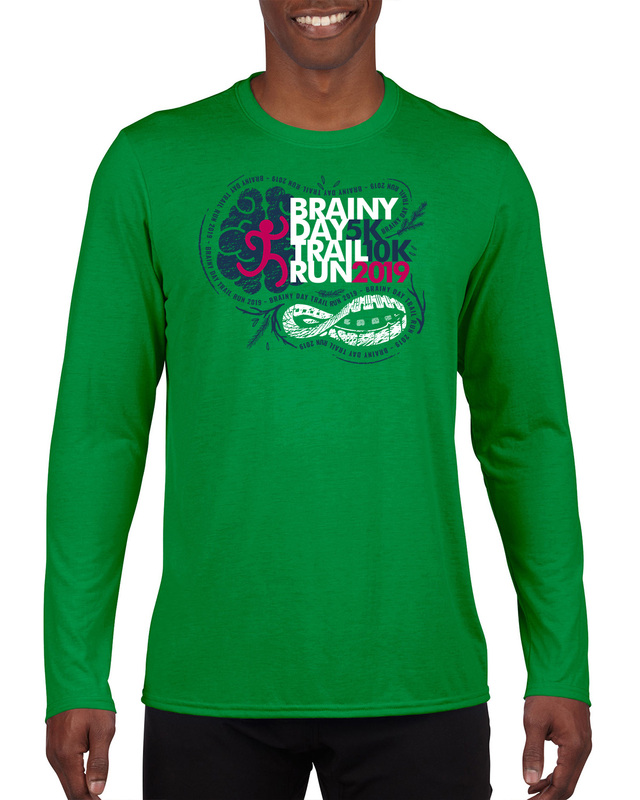 We're a lot different than a lot of races, we don't include shirts as part of your registration fee for two reasons: we try to donate as much as your runner fee as possible to the Brainy Day Fund AND many folks are selective on the type of shirt they'd like from a race. Thanks to our local shirt vendor, we're able to provide lots of options for race gear and we sell them at a price as close to cost as possible. 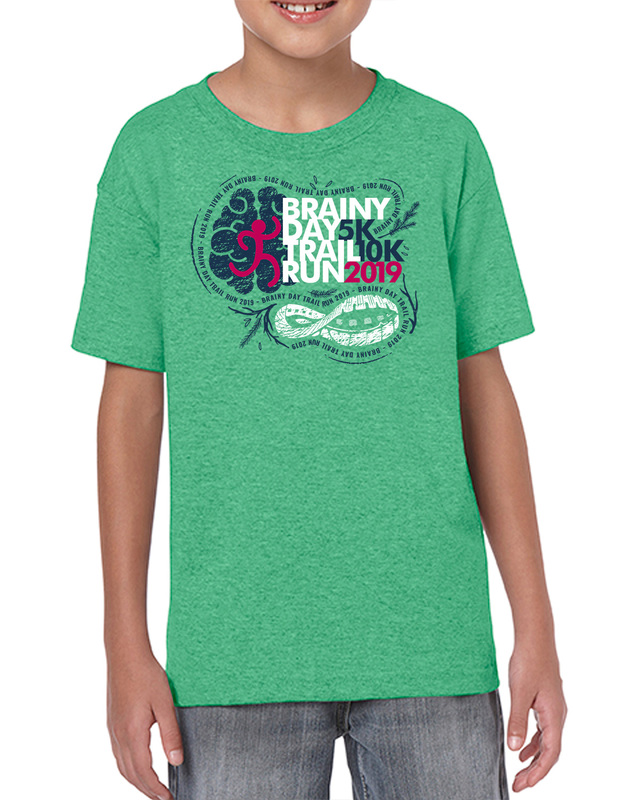 You can order shirts as part of your registration or on race day (prices are adjusted on race day). We were so happy to have Team Stellafly join us last year – athletes & photographers – that we're partnering with them again in 2019. StellaFly will be out on the course, as well as at race headquarters, capturing some of your favorite moments of the day. We're also working with 40 Visuals again to develop a new backdrop for your best post-race medal pictures. Make sure you plan to stick around after the race to enjoy all of the festivities. The 5K course is perfect for new and veteran trail runners alike. It is well-groomed to allow participants the most enjoyment possible. It is challenging with varied terrain, but it offers a unique opportunity to enjoy a solid trail run without feeling too removed from civilization. The entire course is held on privately-held land in Nunica, Michigan. The 10K course is challenging for all levels of runners. Rolling hills and varied terrain make this a true test of your trail endurance. This is a great warm-up race for North Country Trail - held one week after Brainy Day in 2019. Running both the 5K & 10K is not for the faint of heart. Both courses offer great views of the Nunica countryside and will test your endurance limits as you make your way on one of the most unique 10K trail courses in West Michigan. If you're really looking for a test of wills, you should definitely take on the challenge of running both the 5K & 10K at the Brainy Day Trail Run. Race packets can be picked up on race day or on Thursday, August 15 at pre-race packet pickup (Location TBD). To pick-up your packet, you will need your photo ID and provide your race registration confirmation. You will receive the size shirt indicated when you registered. No exceptions or exchanges. If you are unable to pick up your own packet, and need someone else to pick it up for you, they will need their photo ID and provide your street address used for registration. If you need to transfer your bib to another runner, please contact our Race Director. Transfers will not be accepted after August 9, 2019. For the past few years, we've invited folks to come and preview the 5K course a week or two before race day. Join us on August 1, 2019 to check out the course free of charge. 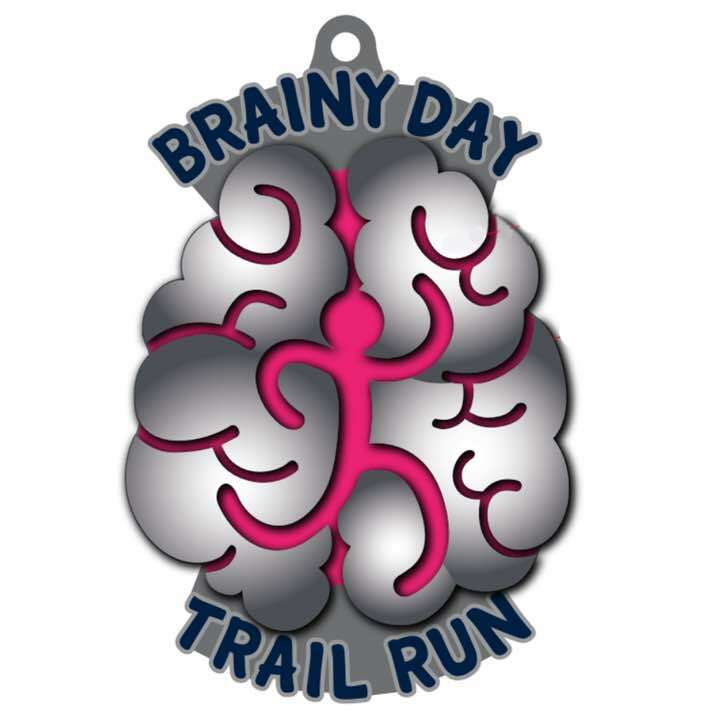 This is a perfect opportunity for first time Brainy Day runners or first time trail runners to get a feel for the course. More information will be available as we get closer to the date. Stay tuned on our Facebook page for more updates.